By coincidence, I have been reading this book during the week that the world was watching with bemused concern as the American economy seemed as if it were going to jump off a cliff through the single-minded intransigence of the Tea Party wing of the Republican party. Will they/won’t they? What if..? Surely not? It strikes me that much the same questions could have been framed by the political commentators after the 1830 election. For as Antonia Fraser reminds us, just as the financial world hasn’t known quite how the brinksmanship in Congress was going to work out, so too those watching the negotiations and brinkmanship over the 1832 Reform Bill didn’t know how it was going to work out either. It was customary that an election be held after a monarch died. In the election held after William IV came to the throne, the Tories, who had been in power for nearly 60 years scraped in with a bare majority. In a country already heaving with unrest with the Captain Swing riots in the wake of rapid industrialization, Prime Minister Wellington declared in the House of Lords his trenchant opposition to any reform of the outdated voting arrangements for Parliament. As a man whose political career was founded on his military success after the French Revolution, he only had to look across the Channel to France where in the wake of the 1830 Revolution King Louis-Phillipe had abolished the hereditary upper house in 1831. And so the stage was set: the House of Lords bitterly resisted any reform that would challenge the personal control of parliamentary seats, but in the House of Commons, amongst the Whigs in both houses, and in the streets and fields outside, the momentum was on for reform. It took two years, a fall of government, another election, and the threat of the King creating additional peers before the Reform Bill was finally and grudgingly passed by the House of Lords. What followed was a decade of political swings and roundabouts, with governments changing, falling, and resurrecting in rapid succession. From a colonial Australian perspective, you can see it in the succession of Secretaries of State for the Colonies who came and went in the 1830s and 1840s so often that Governors must have hesitated over addressing their despatches lest the recipient be ousted by the time it was received. This book marks somewhat of a departure for Antonia Fraser, who is probably more famous for her books on individual French and English royals- Marie Antoinette, Henry’s wives, Mary Queen of Scots etc. (although she has also written on Cromwell, women in 17century England and the Gunpowder Plot). It’s the first of her books to be set in the 19th century as distinct from the 17th, but like all of her other books she looks at individuals within wider political movements. This book centres on the action in and around Parliament in the two years that it took the Reform Bill to finally pass, and ‘the people’ (a much less threatening description than ‘the mob’) are a shadowy presence outside Parliament. It’s a book about Lords a-plenty, both Whig and Tory, supported by Thomas Attwood, the middle-class banker from Birmingham who agitated the middling classes, and the so-called ‘Radical Tailor’ Francis Place who kept ‘the people’ as a restless weapon at the ready. It’s always confusing reading British Parliamentary History because although the titles remain constant, the men who bear them change as fathers die and sons shuffle up the chain of titles to take their place. So I was startled to read that Earl Grey was an old man when he stood up in Parliament in 1830 to push for Reform- and yet he was Secretary of State in the 1840s- how could this be? – until I remembered that there was a 2nd and a 3rd Earl Grey, and that Howick and 3rd Earl Grey were the same man. I must admit that I hadn’t realized that the House of Commons was such a holding-pen for sons waiting to succeed their fathers in the House of Lords, and that socially, the two houses were so intertwined. There’s many familiar names- Brougham, Lord Althorp (3rd Earl Spencer and Princess Diana’s forebear), Sir Robert Peel, Lord John Russell, Durham (of Canadian history fame), Queen Adelaide (the capital city of South Australia, the wine) and even court reporter Charles Dickens. Fraser does well to give this huge cast of characters clear identities and a visual image, and if you do forget who’s who, the index is very helpful. Because the interest of this book is based so much on the debates and tensions in Parliament, it’s a book dominated by politics and individuals. In this way, it’s quite similar to the journalism that has surrounded the machinations in Congress over the passing of the debt ceiling in the last week. 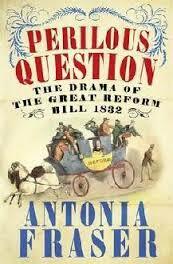 It’s a book for political junkies of the 19th century, but it has lessons for us today as well. For those of us who want quick fixes through Parliament, it’s a sobering lesson. When those who hold power are being asked to vote against their own interests (think the Abolition of Slavery, the Reform Bill, putting a price on carbon), things take time. Change is often incremental, as well. After all the debating, the pressure, the muffled threats of popular dissent, the Reform Bill of 1832 made only relatively small changes. The number of electors increased from 478,000 to 813,000 out of population of 24 million. It took two further Reform Bills, then the final acknowledgment of female suffrage after WWI, before universal voting rights were achieved. The subtitle of the book is “The Drama of the Great Reform Bill”. For those of us who like reading about politics, it is drama indeed. This entry was posted in Book reviews, Nineteenth Century British History. Bookmark the permalink.